Let’s try to keep this short and sweet cos don’t nobody want to read a novel length, in-depth dissection of an instrumental album. The only thing worse than hours of overly indulgent musicianship is having to read reams of gibberish about said hours of music written by someone who doesn’t know his humbucker from his tuning pegs. Not that ‘Mere Mortals’ is overly indulgent. It’s heavy, measured, tuneful Doom-like metal, played with taste and control. The Lumberjack Feedback, in case you’re wondering (and great name btw) are a French 5 piece – including 2 drummers! and ‘Mere Mortals’ is their third album. And, apparently, while we’re at it, the “soundtrack to apocalypse”. So, what does this particular apocalypse sound like? Fairly heavy, unsurprisingly. Most of the songs follow a set blueprint. A booming riff is established before dropping out into a more chilled, exploratory midsection before the guitars re-establish themselves and the main riff reappears in all its furious glory. Riffs are either mid-paced or slightly more urgent than mid-paced and infused with post-rock dynamics. Several tracks also have more than a hint of a beefed up Cure, especially when they meander in their dark, shadowy mid-song forests. The twin guitars work well together, moving silkily like waves over the rock solid foundation. There are drones, occasional moments of near thrash, and many, many moments of zen like six string trance. Songs don’t really go anywhere but then that’s not really the point here. They just lull and roar – calming down briefly before upping the ante, building a sense of anticipation, storm clouds appearing on the sonic horizon. There is a definite story being told, a narrative being meticulously constructed…not an easy thing to do without vocals. Although what this story is I couldn’t tell you. Maybe that’s the idea, maybe you’re meant to write your own tale onto their roiling canvas. ‘Kobe (Doors Of Spirit)’, the final (12 minute) track, sums it all up. The intro is all echoey, slightly fuzzed twang. For several minutes. Then it alters imperceptibly, bulking up. It’s still going strong at the six minute mark when it decides to power up again, becoming epic in its intent and also strangely moving in its insistence. Drums spin around the melody, shifting their placement and the momentum of the riff. We head into a sludgier segment, the riff being played purely in chords. Immense chords – trailing feedback in their wake like so much space debris following a planet levelling meteor. Finally it crumbles under the weight of its own distortion. Cymbals crash and, like a storm at sea, it calms, recedes, and ends with a minute of blissful feedback drone. Essentially, like much of the album, it’s several minutes of the same riff, but fascinating variations thereof. 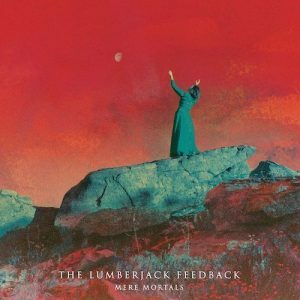 And that seems to be what The Lumberjack Feedback do, like an artist creating multiple variations of a single portrait in differing styles, it’s an exercise in (heavy) bombastic minimalism and an album that improves as it goes. Variations on a theme, viewing riffs from multiple angles and with a loaded palate of colours and brush strokes. a bit like Van Gogh, only with two ears?